Juergens & Andersen are experts at finding and securing the finest quality gemstones for our jewelry collections. We stay in constant touch with precious stone markets around the globe to ensure primary access to the rarest stones. Our jewelry buyers look for clarity, cut and carat of a stone when determining its quality, but above all they concentrate on color as the stone's most defining characteristic. Color is what first captures their eye: the richest, deepest, most intense color gemstones. Another critical consideration is the cut of the stone. We only work with the best, most unique cuts of stone to create our one-of-a-kind creations. How the stone is displayed is also critical. Inside and out, Juergens & Anderson uses only the finest materials. That's why every piece in our gemstone collection is worth its weight in gold. Prized possession of emperors and kings, firing the inspiration of legends and myths, rubies have long been considered the most precious of all gemstones. 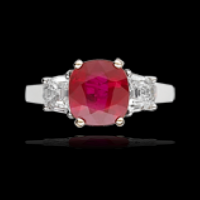 It's brilliant crimson hue brings out passion and love and makes it a favorite choice as an engagement ring. 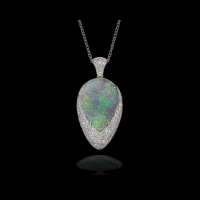 All opals share one characteristic: they shine and sparkle in an ever-changing unique play of colors. From the Greek term "opallios" meaning "color change", this valuable gemstone has been believed to possess healing powers since ancient times. The changing colors reflect our changing moods or emotions. Color –Our gemstones are in the most sought-after tones: the medium-light to medium-dark range. 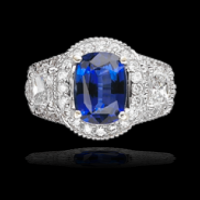 Gershwin rhapsodized about the beauty of the sapphire in "Rhapsody in Blue." Ancient Persians believed its reflection colored the heavens blue. Its shimmering blue luster is a touchstone for such qualities like trust, understanding and loyalty. Sapphire is found in many shades beyond blue– yellow, pink, orange, and purple –which are often referred to as "fancy" color sapphires. Cleopatra collected them. So did the Incas and Aztecs. Long considered an amulet of good fortune, emeralds have been mined from the earth for over 4000 years. 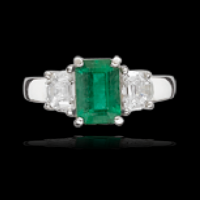 Today, emeralds can be cut into a variety of shapes, from the traditional rectangular "emerald cut," to rounds, ovals, squares and cabochons. 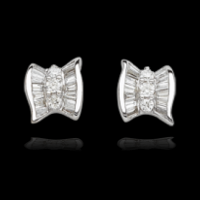 Celebrated since ancient times for their strength, brilliance and ability to refract light, diamonds today are the ultimate symbol of a long-lasting union or marriage. Long associated with the advertising slogan "A Diamond Is Forever," this material mined from deep in the earth adorns more than 78% of the engagement rings sold today.